Ramblings from the Afternoon Tide: How About a Penguin? Christmas specials are a huge favorite of mine during this time of year. I know everyone can say this but they have a different meaning to me. It always gets me to see the hero racing home to either save Christmas or spend Christmas with his loved ones. I get a little fanatical about them and I blame my father for this. The year was 1974 and I was attending first grade at Northside Elementary in Milledgeville, GA. By some crazy coincidence, my teacher’s name was also Richardson even though she was a tall African-American lady. The situation got some double takes but we made it through. It was Christmas break for Georgia College where the Big Guy worked as the Director of Circulation in the library. I always loved this time of year because he’d be home early and we’d watch TV together. One evening, the Big Guy walked in with this monstrosity under his arm. This thing was huge and I could it was heavy because the Big Guy rarely had a strained look on his face when he carried stuff. I told you this thing was huge. Note state of the art channels on right. My father proceeded to explain to me that this was a state-of-the-art something or another. All I caught and comprehended in my six year old brain was that this device could tape things off the TV. As a treat, we could tape all the Christmas specials and I could watch them whenever. I almost began to salivate at the thought of getting to watch Rudolph or Peanuts anytime I wanted. It seemed too good to be true. It wasn’t, It was amazing. The following day was Show-and-Tell to which I had begun to garner a bit of a reputation. Mrs. Richardson didn’t put up with any of my crazy stories so I had toned things down a bit to stay out of being sent to the office. Of course, the magic machine that played my programs on command was too good to keep to myself so I stepped forward. Halfway through my whole spiel, Mrs. Richardson interrupted me. “Robby, are you sure you want to continue telling this tale?” she asked. I nodded my head and attempted to continue but she stopped me again. “Robby, you have a wonderful imagination and it’s going to do you well someday but I just can’t allow you to fib like that. There is no such machine like what you’re sharing. That’s only in Science Fiction.” Mrs. Richardson tried to be matronly but I could also see that stern teacher look lurking in the shadows. Unfortunately, my parents always raised me to stand up for myself especially when I knew I was right. For the next ten minute was a struggle of wills that ended with me crying in frustration. To be fair, I am guessing Mrs. Richardson was feeling the same. Our contest of wills was a draw. I was still crying when Mama picked me up in the car riders line. About a day or two later, the whole magic machine debacle was just chatter best saved for the playground. Everyone had moved on and I just wanted to put it behind me. Mrs. Richardson stopped our Math lessons, which was always fine by me. In walked the Big Guy with his magical machine in tow. Apparently, my old man had called the school and sorted out things with my teacher. The two organized their schedule and Dad had come over not only to prove that I was right but also we had our own screening of Rudolph the Red-Nosed Reindeer. Afterwards my popularity soared and everyone wanted to come over after school to watch Christmas Specials. The Big Guy carried this tradition on with my little sister. As a result, we both can pretty much recite word-for-word most of those old Christmas Specials. 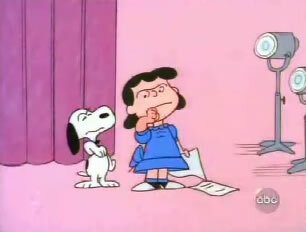 You really got to see Mary act out the Lucy-gives-roles-to-the-Peanuts-cast. “How about a Penguin?” will never be funnier. In 2006, I got my chance, back when I was married, to experience my own real life Christmas special. Things were dark and I’ll just leave it at that. The marriage was limping to an end but neither of us wanted to cut the cord during the holidays. I was still sore about last year when I completely missed Xmas day so we’d could spend it with her family. I know it hurt Mom and Mary. Dec 25th was looking nearer and I knew that I couldn’t handle spending all day with her family again like last year. I made a command decision. We would be going to down the night of the 25th so I decided to head out earlier so I could help prepare for the Oyster Roast we always have the day after Xmas. The ex started to give me grief but somewhere the old Robby roared back to life and I just gave what we refer to as the “Neder” stare in our family. My sister can actually cut through steel with it. Not only did the ex back down, I also got driving privileges to her new Altima in holiday planning session. Score. After a drawn out dinner with her father and new family on Christmas Eve, I crashed early only to be woken up by the alarm around 2 am. I rode that night and it was probably the most enjoyable driving experience of my life. No traffic. Great tunes. New car. The time flew right by in my little Christmas special as I raced home to Savannah to spend it with Mom and Mary. The funny thing about those Christmas specials is that everyon’se timing is perfect. Mine was not so I actually got into Savanna much earlier than I expected. There was nowhere to go that was open and it was cold so I crept quietly into the house around 6am. I passed the time reading some of the books I had gotten from the ex for Christmas. Around 7am, I heard Mom stirring in the hallway so I crept out to make my big entrance. When the right moment arrived, I called their house on my cell from the front porch. “Hello,” a sleepy voice answered. “Mom, it’s me. Sorry to call so early but I am a bit depressed about not being with you and Mary this morning, “ I said, as I tried not to start snickering. “Baby, it’s OK, You have a family of your own now and we understand,” Mom said trying to soothe me. “Well, I guess I need to just drop on by,” and I entered through the kitchen door. The look on my Mother’s face was priceless. She was stunned then overjoyed. Before she could react a tall flash zipped by her and had me in a massive bear hug. It was Mary. At this point all three of us were in tears and Mary wouldn’t let go. Neither could I. She looked up at me with her grin that I know all too well and whispered, “There really is Santa because all I asked for this year was to spend Christmas morning with you and Mom.” Tears really begin to pour at this point. All was needed was for Amy Grant or Faith Hill to sing some sort of chart busting Christmas song. At that point, I made a promise to always spend Christmas with those two if humanly possible. I am happy to say that promise has not been broken and looks like my streak should continue for a long time. As I type, Mary should be landing here in good ol’ Savannah Hilton Head Airport. To say I’m excited is an understatement.